As the rarest Vulture in Europe, the Bearded Vulture is a truly unique bird, and currently huge efforts are being made to breed it in captivity and reintroduce it to the wild. If these colorful and intelligent “Lammermeiers” were to become extinct the loss would be huge. Living in the mountainous areas of Southern Europe, the Bearded Vulture is highly endangered due to human abuse of its populations. This odd and lovely bird is brightly colored because of its habit of scraping against calcareous rocks. These rocks contain iron oxides, which color the birds’ feathers, and when the rocks are not available, the birds’ undersides remain whitish. Solitary creatures, the Bearded Vulture mates for life and establishes a large territory of 200-400 square kilometers, which it defends against other pairs, though it will tolerate other individuals of its own species. Often immature, Bearded Vultures will wander extensively but usually return for breeding to a territory near the one in which they were fledged. Mature pairs never leave their territories. The Bearded Vulture feeds primarily on carrion bones, flying to great heights and dropping the bones on rocks repeatedly until they crack. 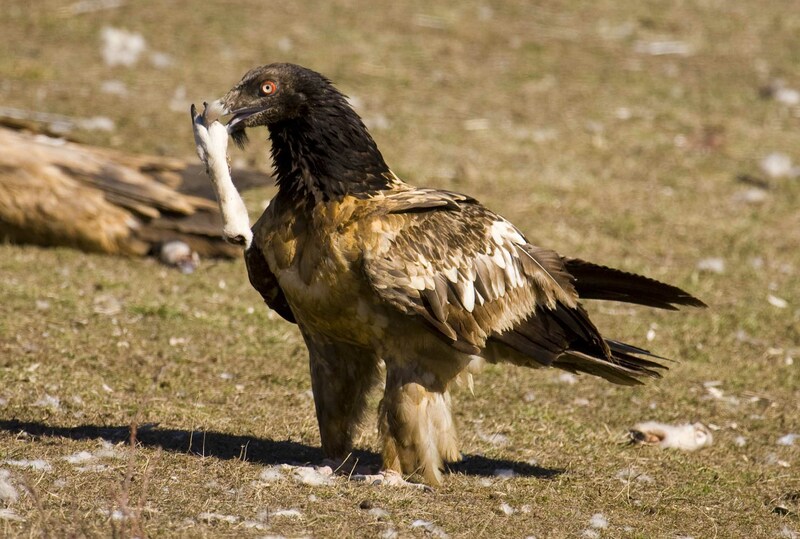 At this point the Bearded Vulture eats the bone marrow and then the bone shards. Bone consists of about 80 percent of this Vulture’s diet, which means it provides little competition for other animals. It can digest an entire vertebra in two days! 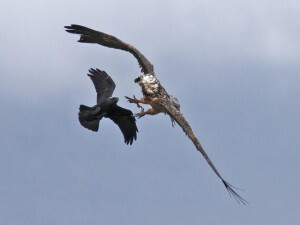 Despite its unique diet, if food is scarce the Bearded Vulture fledglings will kill each other to eliminate competition, which is a shame since the species is so endangered. The Bearded Vulture generally grows to about one point one meters and weighs from five to seven kilograms. The wingspan is usually two point eight meters. The body of the Bearded Vulture is yellow with an orange or whitish underside, depending on the habitat. 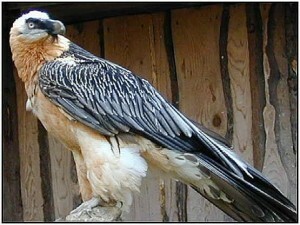 The heads of Bearded Vultures are yellow, but young Bearded Vultures have black heads. The tail and wings are both very large; the tail shaped like a lozenge and the wings long and narrow, black in color. The neck is featherless but near the beak a clump of long feathers resembling a beard characterizes these birds and gives them their name. In the wild the Bearded Vulture inhabits four areas: 77 pairs are found in the Pyrenees of Spain and France, ten pairs on Corsica, three pairs and 25 individuals in the Balkans and Crete, and 4 pairs and 80 individuals in the Alps, where they have been reintroduced. Generally, the Bearded Vulture remains at altitudes above 1500 meters but in winter may be found lower. The threat to the Bearded Vulture comes in the form of habitat loss and poaching, in addition to the poisons in bait set for “pest” predators like wolves, jackals, and crows. Currently rehabilitation programs are underway and the Bearded Vultures are being reintroduced into the wild after being bred in captivity. The Bearded Vulture nests in rocky gorges or caves in steep cliffs during December and January. One to two eggs are typical and are incubated for about 56 days. Generally only one fledgling will survive; the other will starve or be killed. By the end of June or the first part of July, the young Bearded Vulture will leave the nest, however, it will not be sexually mature for another five or six years.